In its first century, the Ford School earned a reputation as a true pioneer in policy education. In 1914 we launched the nation’s first systematic public service training program. In 1969 we launched one of the nation’s first public policy degree programs. And in 1999, we took the name of the University of Michigan’s favorite son, the 38th President of the United States of America. Your generosity—your investment—will power our proud next century of shaping leaders and tackling the toughest public challenges. 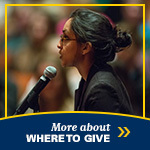 During our centennial celebrations in 2014, we launched the Ford School’s Next Century campaign, part of the University of Michigan’s Victors for Michigan campaign. To train and inspire exceptional citizens, public servants, and leaders. To launch and lead game-changing research projects that transform how we address society’s most intractable challenges. To arm policy communities in the state of Michigan, in Washington, DC, and around the world with first-rate academic insights and discoveries. The Victors for Michigan campaign closed with great success in December 2018. 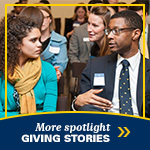 Contributions to the Ford School have a lasting impact. Gifts provide scholarships that bring talented and diverse students to campus, support internship experiences that shape career trajectories, and underwrite game-changing faculty research that will guide tomorrow's policy leaders. Read some of our inspiring donor stories and learn more about why giving matters. As a tribute to the pioneering accomplishments of our first century, and a promise to our next, we established three endowed funds for student support. Follow the links below to learn more and to see a full list of funds where your support can have an impact. 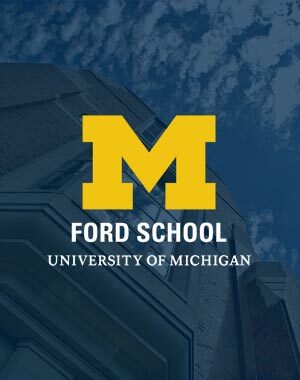 Ford School Graduate Fellowship Fund: an annual fund to support students by providing financial aid packages essential for recruiting and retaining the most talented students; students who will use their Ford School education to become the policy leaders of the future. Ford School Dean’s Strategic Fund: an annual fund to provide financial support for unpaid student internships, faculty research projects, exchange programs, and other strategic initiatives that arise throughout the course of the year. More about where to give. 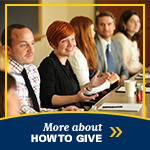 The Ford School is grateful for the generosity and loyal support of alumni and friends. There are several options when making a contribution, from annual gifts, to recurring gifts, multi-year pledges, planned gifts, and more. More about how to give. "The match demonstrates the university's serious commitment to making a U-M education more accessible," says Johnson. "It also provides a fabulous incentive for our alumni and friends to further the impact of their support."